So you dislike small screen tablets but want one that isn’t priced too high, right? Good specifications, low price and the latest version of Android sounds like a pricey tablet to me, but don’t look down yet. Velocity has two new cheap tablets that might fit your budget while satisfying your needs and today I’m going to talk about ’em. Now, they don’t actually have the latest version of Android to say, however they both run on Android 4.1 Jelly Bean out of the box. The company recently revealed their Velocity Micro Cruz D610 and Cruz Q610 tablets. The difference in the names of the tablets is the capital letter before the numbers so don’t mistake one for the other. 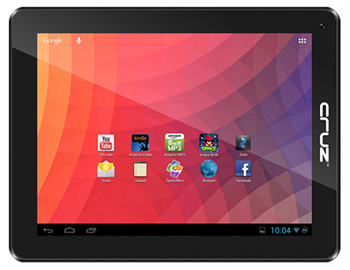 The Cruz D610 will cost you $199 which is the same price someone can pickup the Nexus 7 for. On the other hand, the Cruz Q610 starts at $249 and is available in 3 internal storage models which are 16GB, 32GB and 64GB. The Velocity Micro Cruz D610 tablet features a 10-inch Active Color Backlit LCD display (screen resolution is 1,024×768 pixels), 8GB of internal storage, a microSD card slot for expandable storage space, a 1.5GHz dual-core processor, 1GB of RAM, a micro-USB port and a mini-HDMI port. The Velocity Micro Cruz Q610 tablet features a 10-inch Active Color Backlit LCD display (screen resolution is 1,024×768 pixels), 16/32/64 GB of internal storage, a microSD card slot for expandable storage space, a 1.5GHz quad core Allwinner ARM processor, 2GB of RAM, a 2 megapixel rear facing camera, a 0.3 megapixel front-facing camera, a micro-USB port and a mini-HDMI port. Both tablets were said to be available in the first quarter of this year (I’m not talking about the Cruz Q610’s 32 or 64 GB models) so if you’re thinking about getting either of these tablets, you should stock up on those pennies right away and see if you have a budget for one when the time comes.